Yellow split peas. I like them. A lot. Cheap, easy to prepare, creamy, versatile, naturally gluten-free and vegan, and loaded with protein to fuel me through long days and long runs alike, my affection runs deep. The color is key; it’s yellow or bust. Despite green being my favorite color, I am no fan of the green split pea. The green variety looks so pretty when dry, but cook them and they take on a gray-brown cast akin to a muddy army jeep. Green split peas have a sharper pea flavor, too, which would be wonderful if I liked sharp pea flavor, but I don’t. By contrast, their golden cousins are mellow, creamy, and play beautifully with other flavors both mild and strong. This humble soup is one I have been making since my graduate school days–a perfect post-Thanksgiving repast that is soothing, satisfying and energizing (10K run after work, anyone?) in one fell swoop. It looks like a bowl of sunshine to boot, so go ahead and spoon up some cheer. Dried split peas, like other legumes, are rich in soluble fiber. They also contain an isoflavone called daidzein, which acts like weak estrogen in the body. The consumption of daidzein has been linked to a reduced risk of certain health conditions, including breast and prostate cancer. Split peas are particularly rich in potassium, a mineral that can help lower blood pressure and control fluid retention, and may help limit the growth of potentially damaging plaques in the blood vessels. Yellow pea soup is traditionally served every Thursday night in Sweden. If you’ve ever wondered why bags of yellow split peas are sold at IKEA, that’s why! In a large saucepan, heat oil over medium-high heat. Add onions, carrots and pepper; cook, stirring, for 6 to 8 minutes or until vegetables are softened. Transfer 1 cup of the soup solids to food processor. Add water and purée until smooth. Return purée to pan and stir in half the parsley or dill. Simmer, stirring often, for 5 minutes to blend the flavors, thinning soup with water if too thick. Serve sprinkled with the remaining parsley or dill. * An equal amount of dried yellow lentils or green split peas may be used in place of the yellow split peas. * Store the cooled soup in an airtight container in the refrigerator for up to 2 days or in the freezer for up to 6 months. Thaw overnight in the refrigerator or in the microwave using the Defrost function. Warm soup in a medium saucepan over medium-low heat. Made the soup with dill to rave reviews from the kids (they had 2(!) bowls). Great stick to the ribs soup for winter. Thank you for the recipe! Just made this recipe and it was amazing! Thanks for sharing! Yay, so glad you liked it!!! Camilla, I was going to make this using the red lentils but much to my surprise my local bulk food had the yellow split peas. I made it last night for my Bible study class using frozen dill from the summer, and everyone (9 people) loved it. I just carried the recipe and a bag of the peas to my pastor. What a beautiful, simple, and I’m sure tasty soup! I had no idea that yellow split pea soup was such a tradition is Sweden. I made this and added a few things to make it a little heartier like Kale and sausage, however, I did all the beginning steps as you listed and the peas after an extra hour and then some are still not as soft as I’m used to. I looked it up and they said adding an acid or a salt before the beans will keep them from softening quickly. No one else has had this issue w/ the bit of salt that’s added at the beginning? (sorry about the missing capitalization. Even with the caps lock on for some reason leaving this comment it won’t let me capitalize anything.) Thanks! Oh no, I am so sorry that happened. I can tell you this, though: it has happened to me. The amount of salt is most likely not the problem, but rather the peas. There is actually a name for peas that, for a number of reasons, get too hard and will not break down–it’s called HTC (there is a name for it, really!). It has to due to the storage and the age of the peas–not your fault (i.e not that you stored them improperly or that you have had them too long), but that particular batch of peas had issues. There is a long discussion of it on CHOW.com. Here is the link. http://chowhound.chow.com/topics/754994 I am sure that, with a new batch of peas, you will have lovely results! I found your recipe while trying to locate the original back-of-the-bag recipe from Goya. Goya doesn’t publish their recipe online. Their version is really minimalist: Soak the peas, add two chicken bouillon cubes and six cups water and bring to a boil, add chopped carrot, onion and celery, cook until all is tender, add salt and pepper to taste, that’s it. No oil, no sauteing vegetables beforehand, just simmer it all together. I had no celery today so I substituted a cup each of chopped fresh tomatoes and frozen chopped spinach, and a bay leaf. If I’d had parsley I would have thrown that in too. The soup was quite good (would have been better with fresh dill, If I’d know. I love the idea of adding spinach and tomatoes, Ellen! Hi THere. THis sounds really tasty and I’m looking forward to trying it out. Did you soak the peas overnight before cooking? I was going to make this last night and then realised I was meant to soak the peas so am doing that now. But just wondering how necessary it is to soak the peas and why people do it? Cheers! Hi there! I am about to give it a go, I never usually leave replies like this but I loved your lead up before the recipe and your replies to people are so upbeat and friendly I couldn’t resist lol! It sounds really yummy, normally I just boil the peas up with salt and lots of water until they dissolve and eat it the way. I was looking for something different which is how I found yours. I’m not a giant fan of carrots but I will give it a go! It looks lovely. I’m going to try it tonight – suits a cold and wet Sydney evening. Looking forward to it. I was looking online for a recipe for yellow peas and I cam across this one. It looked delicious as well as wholesome so I decided to give it a go. The really good thing about this recipe is that it is very easy to create. The result – beautiful – tasty and simple. I made this tonight and have just tasted it – delicious. I’m looking for fat burner recipes and this seems to fit the bill for me. Thank you so much for the recipe, and nice to get the background information too. So glad you enjoyed it, Dougie! I wanted to try this just as you presented it, but caved and added two sliced up pieces of raw bacon as it started cooking. Gave it a few whomps with a potato masher instead of taking some out to puree; otherwise made as presented. Wow. So much better than expected. I think it would be as delicious and satisfying without the bacon, but I wanted a little more complete protein. Even hubby was impressed. Yum! It looks nice! I noticed someone using bacon which is a nice touch as it traditionally is made with cured pork, like cured ham hock. But I would like to ask why the spices are left out? Traditionally you should have marjoram, thyme and cloves besides salt and pepper. Dried bay leaves is good to add as well. Just tried this to use up so split peas that had been floating around my cupboard for ages and loved it. So simple, so few ingredients but very rich and satisfying. Will also try other people’s suggestions of bacon and leafy greens next time too. A winner! Have had a bag of yellow split peas in the cupboard forever, and this afternoon finally decided to do something with it. I’m so glad I picked your recipe for this wonderful soup. It was easy to follow and I had everything available except for the dill and parsley. Since someone here mentioned using bay leaves and that’s what I had, I put in two small leaves, then decided to also include half a tablespoon of dried basil. I don’t know what the soup is supposed to really taste like, but I definitely love the result. Next time, will plan ahead and make with parsley, marjoram and thyme. Thanks! You are so welcome, Arlene!!! 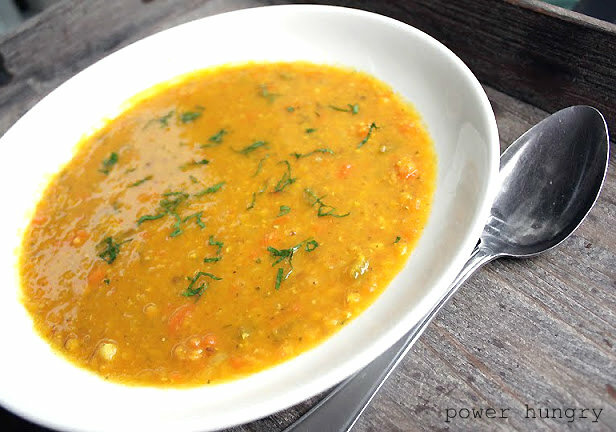 My husband asked me to make yellow split pea soup, and never having had it myself I wasn’t too sure how it would turn out. I also didn’t have all the ingredients or the quantities of some of the ingredients I needed, however I must say this soup turned out wonderfully, and was so simple to make! Thanks for the recipe. I think he will enjoy it too!! So glad you enjoyed it, Megan! I know, love the yellow split peas — I find the taste milder than the green ( in a very good way), too. Do you happen to know the nutrition content? Thanks! Wow! I wasn’t sure what to expect from this soup but I had a giant bag of split yellow peas in my cabinet so I decided to try it. I followed the recipe exactly but used dried dill since that’s what I had on hand. This soup is so hearty and delicious I can’t wait to make it again! It’s pleasantly sweet which I wasn’t expecting. And to top it all off I used about $4 worth of ingredients to make the whole pot! Can’t beat that! Thank you so much for this recipe. I really struggle to find recipes with vegetables that my toddler will eat and he loves this soup! I keep the ingredients on hand and have been making it every couple of weeks – so quick and easy! My wife and I just had yellow pea soup for our lunch. She added parsnips and carrots and onions. It was AMAZING! We finished with chilled blueberry soup…SOOOOO GOOD! This is a nice little soup that I have made several times already. Easy to make. I make it with dried dill because getting fresh herbs isn’t always practical for me, but it still tastes great. 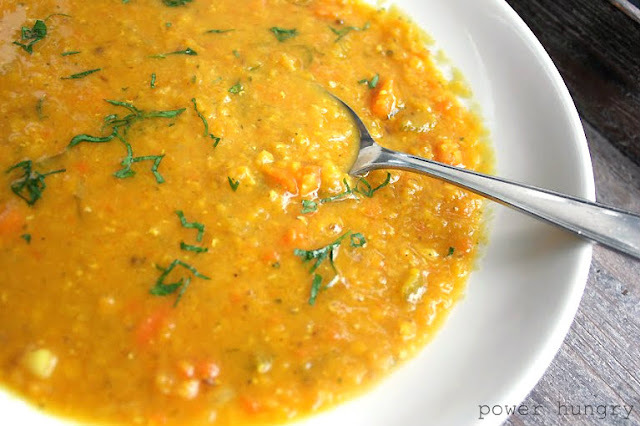 If you like pureed soups, (which I love!) and you are still using a food processor, I recommend you purchase an immersion blender. It is so much easier than having to transfer the soup; simply puree right in your soup pot; the results are identical to a food processor without the added work and mess. Hello! I made this with the yellow split peas and LOVED it. I wanted to make more and went to get more yellow split peas but they were out! Do you think this would still taste as good with green split peas? ?